This lesson will show you how to install new templates for ScreenSteps. 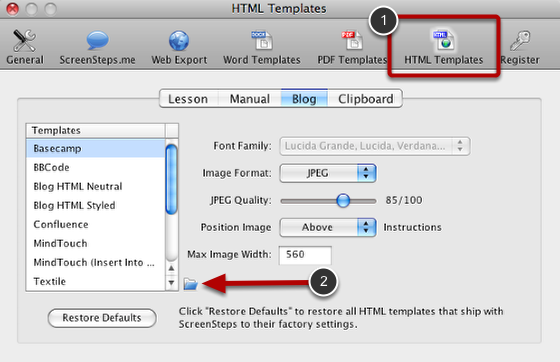 You can also use this method if you would like to move your custom templates from one machine to another. Open Preferences > HTML Templates and select the folder icon. This will open up the templates folder on your system. The templates folder just contains folders for each type of template. In this example we are going to add a new Blog template. Select the Blog folder. Now just add your template to the Blog folder. It will automatically show up in your list of templates. 1. Open the template folder as described above. 2. Copy the template folder you want to move. 3. Move the folder to the new system and follow the instructions above to install it.